If you’re looking for a car battery, look no further than JTT Autotech, we stock a huge range of car batteries so you’re sure to find the right one for your vehicle. 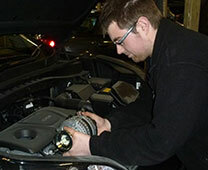 Cold weather can expose the weaknesses in a failing or faulty car battery so don’t get caught out in the cold snap. We provide a free Battery inspection for you and can let you know if it’s time to get a new battery. At JTT Autotech we have the latest Bosch equipment which is capable of testing your Battery and Alternator condition . Just give us a call and we will be happy to book you an appointment.